In a freak accident at Janak Setu in west Delhi, a 32-year-old male nurse was killed when a barrier fixed at the foot of the under-repair flyover fell on his motorcycle, the police said today. The incident took place at 10 pm on Saturday. 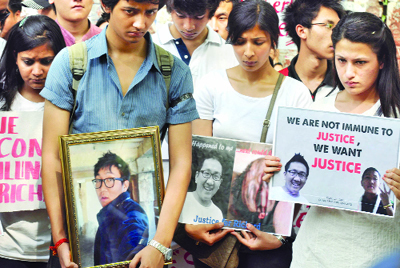 Members of Manipuri Students' Association today protested at Jantar Mantar, seeking justice for the Manipuri student Richard Loitam who was found dead in his hostel in Bangalore under suspicious circumstances on April 18. In a new development in the scam of fake driving licences, the Delhi police has registered one more case against a job aspirant who allegedly submitted a forged driving licence to secure a driver's job. The outer district police has arrested a person for being allegedly involved in the murder of a resident of Rohini. The accused, Pradeep (23), was arrested yesterday from the area of Sector-17, Rohini, said BS Jaiswal, deputy commissioner of police, outer district. Lakhs of science students across the city today appeared for the 11th All-India Engineering Entrance Examination (AIEEE) which went smoothly across all the centres in Delhi. According to Central Board of Secondary Education (CBSE), around 10 lakh students sat for the offline examination, which was organised at 1,735 centres across the country while another 1,64,000 candidates took the online test at 221 examination centres. A three-day long festival of devotional music 'Bhakti Sangeet' concluded today on a high note, with Pakistan's noted Sufi singer Sanam Marvi mesmerising the audience that included Delhi Chief Minister Sheila Dikshit. With the coming of new academic session at Delhi University, many admission reforms are likely to be introduced for the convenience of students. 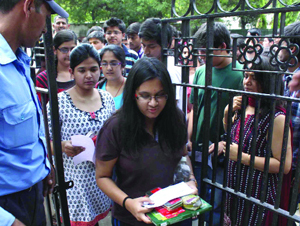 After two years, the common admission forms will make a comeback. Registrations will be possible--both online and at the university counters. To bridge the gap between commuters and Metro stations, eco-friendly electric rickshaw service has been launched in the city . The victim has been identified as Jasram Meena, who lived in Dabri and worked as a male nurse with ESI Hospital. He was returning home with his wife Urmila Devi from the Delhi Cantonment area when the accident took place. 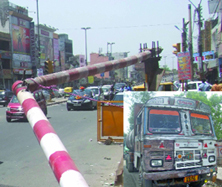 "Jasram and Urmila were at the foot of the flyover when an oil tanker hit an iron-beam installed as height barrier. It later fell on the carriageway on which the couple was travelling and struck Jasram on his face," a police official said. After receiving the information, the police rushed to the spot and took them to Deen Dayal Upadhyay Hospital. "Jasram was declared brought dead by doctors. He had suffered head injuries, but Urmila, who was riding pillion, miraculously escaped with minor injuries. She was discharged after first-aid treatment," the official added. The errant tanker driver, Bhim Yadav, 55, who hails from Azamgarh district, Uttar Pradesh, was overpowered by the locals and handed over to the police. A case has been registered against the driver at the Mayapuri police station. He faces charges under Sections 304 A (causing death by negligence), 279 (rash driving) and 337 (causing hurt) of the Indian Penal Code. After postmortem, the police handed over the body to his family in Harinagar. The Municipal Corporation of Delhi (MCD) had reopened the flyover, one of the main bridges connecting the western part of the city with South Delhi, to light traffic on Saturday since it was shut for repairs after a sag was noticed in June last year. For now, height barriers have been installed to ensure that heavy vehicles don't ply on this stretch. The officials of the Municipal Corporation of Delhi believe that the flyover will be fully repaired and open to all types of vehicles by the end of June. According to the association, the murder happened as because of the criminal negligence of the colleges. "Their acts of omission and commission indicate a conspiracy to protect the criminal," said a protester. The police has not made any headway in the case and that has annoyed his friends. Many of them today gathered at Jantar Mantar in a silent protest, urging the authorities to take suitable action in this regard. "The collegeauthorities are to be blamed as they are indifferent to the incident. It's been almost 11 days, but no one has been taken into custody," said the other protester. Many students had also gathered at Town Hall. Richard was a second semester student of the Acharya NRV School of Architecture in Bangalore. While the police said Richard died because of an accident, the 19-year-old victim's friends insist that he was assaulted by seniors aand succumbed to injuries. "The police hasn't taken the students into custody yet. They are still attending classes. That is not fair. We want justice. We will also hold a candlelight vigil at India Gate also," said another campaigner. Meanwhile, a social media campaign is also building up, seeking justice for Richard. His friends have set up a Facebook page which has over one lakh members so far. The sixth FIR in the episode came after 296 out of 676 people selected for the post of driver in the rank of constable in the Delhi police were found to have submitted fake or forged licences for securing the job. The fresh case has been registered against Rajpal, a resident of Mohindergarh in Haryana, who was provisionally selected for the job. According to investigations, some of them who submitted the licences were not even aware that these were forged as they had paid money to agents but were duped. On March 30, the police registered cases against five persons Hari Om, Deepak Deswal, Dalip Singh Jat, Lalit Kumar and Sanjeet Kumar. A fresh case of cheating and forgery have been registered against Rajpal. "He mentioned having in possession HTV driving licence issued by the Licensing Authority in Narnaul on August 3, 2004 and valid up to September 26, 2009. The verification report from Narnaul revealed that the licence was initially issued from Nagaland. "The candidate stated that the driving licence was issued to him by the Licensing Authority in Wokha, Nagaland. Subsequently, the licence was sent to Wokha and it came to light that there was no record regarding this licence," said a senior police official. Following this, a complaint was filed at the IP Estate police station by Ishwar Singh, Deputy Commissioner of Police (Establishment). However, Sandeep Goel, Joint Commissioner of Police (Crime), said no one had been recruited in the Delhi police on the strength of fake driving licence. On the issue of recruitment of drivers, the Delhi police had advertised for 676 posts of constable (driver) in February 2009, he said. "There were 21,000 applications received and after following the due selection procedure of physical test, written examination, driving skill test and interview, 656 candidates were provisionally selected," Goel added. However, before issuing the offer of appointment to a candidate, his character and antecedent verification, driving licence verification from the transport authority concerned and medical examination was carried out. The verification reports received from the Mathura and Agra Transport Authorities revealed that the driving licences submitted in respect of 284 candidates were fake. Twelve driving licences issued from north-eastern states were also found fake, Goel said. Two hundred ninety-six candidates were issued show-cause notice and their candidatures have been cancelled, even before issue of any offer of appointment, he said. The victim was Ravi Goyal (33). His murder was reported by his wife on the night of April 25. Pradeep allegedly shot Ravi in the forehead with a country-made pistol during an altercation between the two. The two were playing cards at Ravi's office when the crime took place. After killing Ravi, Pradeep took his mobile phone and other belongings from the office and fled, according to the police. Pradeeep has confessed to have killed Ravi. He revealed that he had concealed the empty cartridge in a plot. He then crushed the mobile phone with a brick and threw it in the Bawana canal. "Pradeep had kept the SIM card of Ravi's mobile phone for making threatening and extortion calls in future. He had also concealed his blood-stained shirt near a waiting hall of Rohtak Medical Hospital where he had gone pretending to be a patient's attendant," said Jaiswal. "Ravi had befriended Pardeep while he was in a Rohtak jail in connection with cricket betting. Pardeep is unmarried and has studied up to class IV. Before getting into crime, he used to work as waiter in marriage parties. He had come out from jail in April, 2011. He has five previous criminal involvements, said the police. "Country-made pistol used in the commission of the crime, victim's SIM card and mobile phone, an empty cartridge of the bullet fired on the victim have been seized from him. Efforts are being made to recover the accused's blood-stained shirt," added the police. Lakhs of science students across the city today appeared for the 11th All-India Engineering Entrance Examination (AIEEE) which went smoothly across all the centres in Delhi. According to Central Board of Secondary Education (CBSE), around 10 lakh students sat for the offline examination, which was organised at 1,735 centres across the country while another 1,64,000 candidates took the online test at 221 examination centres. Principal of local Delhi Public School (DPS) Sidharth Rath, who is also the examination coordinator, said altogether 16,750 aspirants appeared at the AIEEE examination being conducted by CBSE in 29 centres here. As many as 1500 staff members were deployed for smooth conduct of the one-day test in all the examination centres. AIEEE is the most popular engineering entrance exam after IIT-JEE. Over the years the number of both the candidates and the centres has gone up. The exam is regarded as the gateway to 30 National Institutes of Technology (NITs), besides five Indian Institutes of Information Technology (IITs), central and state-funded institutions and self-financed deemed universities and other institutions. The final day presentations included Buddhist chanting by the Silence of Soul band and Kabir bhajans by Sitanath Biswas. The spiritual performances cast a spell on the audience, who enchanted hymns, soul-stirring vocals, and sacred lyrics with India's most famous devotional music singers. The three-day fest, organised by Sahitya Kala Parishad and the department of art and culture of the Delhi government, kicked off on April 27. The festival that attracted people from all age groups and religions started with a spell-bounding performance of Astitva Band who sang a vedic sanskrit composition by a Muslim duo, showcasing the religious harmony of the Indian society. "We are extremely glad to receive such an overwhelming response from Delhi. It has been an absolute pleasure to organise the event here. I hope the three-day festival has ignited belief and faith. I want to thank all performers, vocalists, singers who came together," said Keshav Chandra, secretary, department of art and culture. A single form will give the aspirants accessibility to apply to all 70 DU colleges. The move was finally confirmed by the vice-chancellor this week. Last year, due to the absence of these forms, the university faced much chaos and ended up overadmitting students in almost all the colleges. The fact that many Muslim voters exercised their franchise in favour of BJP candidates in municipal polls has surprised the community leadership as since Independence, they have always been supporters of the Congress. In many municipal wards where Muslim voters are in good number and could be a deciding factor, the Congress could not win the election or won just with a few hundred votes. In some wards, Muslims openly voted in favour of the BJP. In Nizamuddin alone, about one thousand Muslims voted for the BJP candidate though he lost the election. In Qasabpura, Muslim voters are in a majority but the election was won by a BJP candidate, Noor Bano. In Zakir Nagar and Okhla municipal wards, the BJP was in the third position. In many other Muslim-dominated wards, the SP and BSP candidates won the election. The announcement of financial help to madrassas after the Congress defeat in the MCD election is taken as an appeasement policy of the party. It is believed that in this election, Muslim voters have not voted in favour of the Congress candidates and that was the reason for the party's defeat. Even in the East Delhi Municipal Corporation where Muslims are in a majority in the maximum number of wards, the BJP emerged victorious. Assembly elections are to be held next year, if the Muslims adopt the same stand, the Congress may face a difficult task. If the policy on financial help to madrassas is implemented, the party may get some benefit. However, some leaders of the community are not in favour of taking any financial grant from the government. They think that the government may then interfere in the madrassa education. To the embarrassment of leaders of Municipal Corporation of Delhi (MCD), the international recognition to the civic agency has been withdrawn. The agency had been awarded the 'AA' by 'Fitch Ratings' last year. The recognition was much lauded by BJP leaders during municipal elections. The company now states that instability and trifurcation of the local body are the main reasons behind its latest move. The announcement has left the leaders of BJP-ruled MCD red-faced, who thought of banking on the corporation's image and achievements to present a good show in the next year's Assembly elections. The state-of-the-art public transport system has been started by Green Wheels Private Ltd., a subsidiary of the Argentum Group. Branded as G-Rik, these eco-friendly electric vehicles will bring in a world-class mode of travel and provide a more efficient, faster and better quality public transport system.